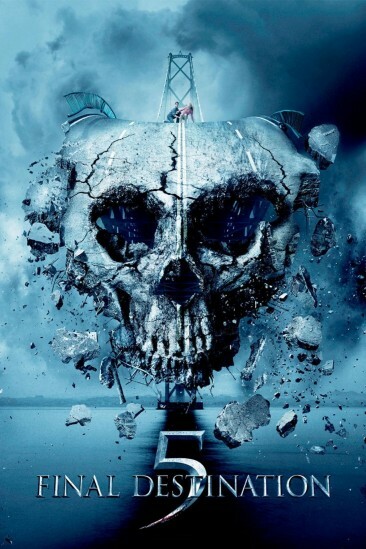 Final Destination 5 is five times familiar and five times "3D". As an individual that believes gimmicky 3D effects are just, well, unnecessary gimmicks, this fifth instalment purely focuses on blood, guts and eyes flying at your face. Whilst a step up from the abomination that was 'The Final Destination', this time around we see a group of young students avoid yet another catastrophe (suspended bridge crumbling because of "high winds") thanks to a premonition. However, Death has nothing better to do than to be creative again and find the most unlikeliest of methods to kill these individuals. You all know the drill. A formulaic disposable horror that is rapidly feeling dry featuring a cast of dull actors that portray one-dimensional characters. You watch in the hope that you'll be invested in the story, but you stay for the absurd death sequences. And that is exactly what makes this movie tolerable, the ingenious deaths. Another chapter that has scarred me from going to the safest of places. No more do I want to go to an acupuncturist, nor will I ever fix my eye sight and receive laser eye surgery, and I definitely will not be doing gymnastics (which is a shame because I have the potential...*cough*). What makes this entry that little bit more spicy compared to its predecessor, are the "red herrings" that are precariously placed. The camera focuses on water dripping next to a live wire, building the anticipation that this oblivious girl is going to get electrocuted, only to find she gets killed by something else. Classic misdirections that make the experience that little bit more enjoyable and anxiety-inducing. It strangely concludes by linking back to the first 'Final Destination'. It's a nice touch for fans, but feels wholly unnecessary and a huge amount of wasted potential. Particularly as a coroner constantly keeps babbling "Death doesn't like to be cheated" and that he has "seen this before". The visual effects were mediocre and the weird tonal shift towards the third act felt misplaced. It's not a return to form for the franchise, but it is an improvement from the fourth entry.